Consultation Digest Issue 19, 09 October 2018: Byres Road rethink, beyond Parkhead on the East City Way, and much more. Many thanks to Iona for keeping you up-to-date so well while I was off on a big tour of Kenya – four weeks without getting on a bike – and what news there was. A massive rethink on Byres Road! Didn’t we all do well! That’s the power of lots of us letting people know our views, so please keep writing and answering those surveys. Let’s hope Byres Road does become as peaceful as this earlier publicity picture suggests, but with those all important segregated cycle lanes. GoBike Hustings – a Success! Here’s the panel from last night’s Hustings getting ready for the debate. From left, Anna Richardson, SNP, Robert Brown, LibDem, Tricia Fort, GoBike Convenor in the centre, Christy Mearns, Greens and Martin McElroy, Labour. Questions ranged from should local authorities use their own money for cycle schemes rather than getting funding via Sustrans to why don’t we reduce danger on our roads to do our councillors need a car parking space at council offices and more. It was a busy, informative evening. If you were there or not, you can still ask your council candidates searching questions, see the guide on the Walk, Cycle, Vote website: http://walkcyclevote.scot/what/ There is information on all your candidates on this excellent website. Hustings – it’s tomorrow, don’t forget! Yes, our Hustings for the Local Government Elections on 04 May takes place tomorrow, 19 April at the Admiral Bar on Waterloo Street, Glasgow. Doors open 7pm, the event starts at 7:30. In collaboration with “We Walk, We Cycle, We Vote”, Greater Glasgow’s cycle campaign Go-Bike! presents an election hustings tomorrow night at the Admiral Bar, Glasgow. Featuring candidates contesting elections in East Renfrewshire, South Lanarkshire and Glasgow, the evening promises lively political debate, with a focus on cycling strategy. With 2017’s local election expected to be one of the most significant in recent history, representatives from the SNP, Labour, Conservatives, Lib Dems and Greens will be pitching their parties’ active travel policies to West Central Scotland’s cycling constituency. Doors open at 7:00pm, with the hustings commencing at 7:30 in the Admiral Bar, 72 Waterloo Street, Glasgow, G2 7DA. Go-Bike! 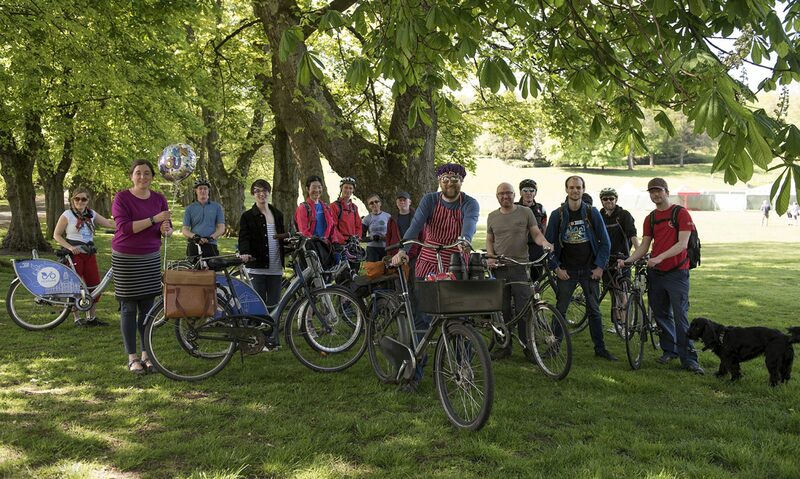 is a cycle infrastructure campaigning organisation, covering council areas in the former Strathclyde Region: Glasgow, Dunbartonshire, Lanarkshire and Renfrewshire, with a focus on infrastructure and the built environment. Our campaign is entirely funded by membership fees and donations, with no input from government or third parties. GoBike campaigns for cycling to be a natural way to get around for people of all ages and abilities. We are composed of people who cycle and we want good cycle infrastructure to enable this. We have a change from our initial line-up for the hustings. Alan Moir from East Dunbartonshire has sent his apologies and Scottish Labour proposed that Martin McElroy take his place. “I was first elected in 2012 to represent the Hillhead area of Glasgow. In 2015 I was appointed the city’s Cycling Commissioner and have been involved in the development and implementation of the council’s cycling strategy. Tomorrow, links to the election manifestos for the 5 parties. “I’m Christy Mearns, the Scottish Green Party candidate for Anderston, City & Yorkhill. Over the years I have campaigned for change locally and represented the Scottish Green Party in the previous two by-elections for the Ward. I have worked hard getting to know the issues important to people living and working here. If elected, I promise to work hard to deliver cleaner, safer public spaces; to encourage local businesses to thrive; and to continue to be a strong voice for the local community on the issues that matter to them. Tomorrow, the Labour Party candidate for our panel, a change from our original booking. “I am not much of a cyclist. I have come off this year twice and damaged myself (off-road thankfully), but God loves a trier and persistence is often rewarded. I have degrees in politics and economics and work as a health economist for a healthcare company. My particular interests are health inequalities, diabetes and telehealth / remote monitoring. I am also a local Councillor in Newton Mearns and have been for 10 years. Newton Mearns is a lovely part of the world and has good access to both on-road and off-road cycling. Tomorrow, the Green Party candidate for our panel. “I have been a councillor for Langside in Glasgow since 2015, and am one of the SNP candidates for this election. I also work part time for NCT, a national parenting charity, as well as caring for my three young children. I have an honours degree in Geography and a Masters in Human Resources, both of which have informed my work in the Council. My particular interests in the Council are varied, but all centre on making our city a better place to live, in particular for women, children and families who are often affected the most by our policies. I am passionate about education, especially early years and childcare, as well as planning and active travel. There is so much crossover between all these issues, and seeing where those connections lie is critical to achieving the best outcomes. I took up cycling three years ago, but have only used it as a regular mode of transport in the last 12 months, having felt apprehensive about sharing busy roads with cars and buses. I am the proud owner of a very reliable hybrid, and resisting the urge to invest in any more wheels for the time being! Having spent most of my adult life feeling too scared to cycle has shaped the way I view active travel, and the steps we must take if we are to make real progress. My vision for Glasgow is a city that enables anyone to jump on a bike, however young or old, and regardless of fitness level. And I will always make the case for active travel as a social justice issue that reduces air pollution for all and provides cost effective transport to households whether they are carless through choice or financial necessity. Tomorrow, the Conservative candidate on our panel. “Robert Brown is a Liberal Democrat Council Councillor on South Lanarkshire Council. He was MSP for Glasgow Region (1999 to 2011) and Deputy Minister for Education and Young People (2005-2007). He was spokesperson on social justice and housing, and later justice and civil liberties. HE fought Glasgow Region and Rutherglen constituency for the Liberal Democrats in the 2016 Scottish Parliament elections. A solicitor by profession, he worked as a Procurator Fiscal Depute and latter became senior civil partner with a large Glasgow firm. He was a longstanding Policy Convener of the Scottish Liberal Democrats, and served on the Steel Commission and the Campbell Commission which set out the Liberal Democrat vision for Scottish Home Rule within a federal United Kingdom. Robert was the first candidate to forward information to us; details of the 4 further candidates will be published over the next 4 days.